7th October, Jakarta: 2008 champion and top seed, Sharon Limansantoso of Indonesia needed two games to beat challenger, Shalin Zulkifli of Malaysia to regain the Women's Open Masters crown while Isaac Russell Paul of Malaysia, won his first major title. Limansantoso, who topped the Round 2 finals earlier, was forced into the decider after losing to second-seed and challenger, Shalin, 205-243 in the first game of the title match. But she fought back galantly to take the second and the title with 232-213. "My opponent bowled well in the first match but I kept telling myself that if I have faith, I can overcome her in the second match," said 27-year-old Indonesian, who won her first home title at the 6th Indonesia Open in 2008. The champion shot into the lead after rolling a big game of 276 in the eighth game of the earlier 10-game Round 2 finals. She completed the round with 2137, just 3 pins ahead of Shalin in second to advance into the stepladder finals. Shalin booked her place in the tite match by edging third-seed, Geraldine Ng of Singapore and winner of the first match, Novie Phang of Indonesia, 243-223-202. Phang took the first match, 215-180-174 against two Malaysians, Sharon Koh and Wendy Chai to advance to the second match. Defending champion, New Hui Fen of Singapore missed the stepladder cut by 2 pins after she finished seventh in Round 2. 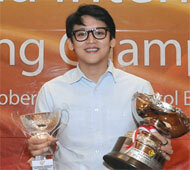 Limansantoso won 50 million Indonesian rupiah (approx. US$5,210) as champion. Shalin picked up 25 million rupiah (approx. US$2,608) as first runner-up and Geraldine took home 12.5 million rupiah (approx. US$1,300). Phang, Koh and Chai earned 10 million, 8 million and 6 million rupiah respectively. In the Men's Open division, second-seed Isaac Russell Paul of Malaysia got the better of top seed and EBT leader, Dominic Barrett of England over both the matches to clinch his first major international title. Isaac took the first match, 202-170 after both had struggled in the beginning of the match and the Malaysian had to strike out to edge Barrett, 241-232 in the decider for the victory. "When I had three opened frames in the first match, I thought I had blow my chances," said the Malaysian national elite squad member, Isaac. "But when Dom also struggled, I knew I had a chance. "Luckily I had better carry and was able to knock down six strikes in a row and Dom continued to struggle. My opponent did mount his challenge strongly and I just kept my nerve and focus on the job." The champion earned a crack at the title by defeating defending champion and third-seed, Yannaphon Larpapharat of Thailand and winner of the first match and 2010 champion, Hsieh Chin Liang of Chinese Taipei, 202-181-190 in the second match. The Taiwanese spinner, who squeezed into the stepladder finals in sixth position, beat fifth-seed and Round 1 leader, Surasak Manuwong of Thailand and 2009 champion, Zulmazran Zulkifli of Malaysia, 210-164-204 to advance. Isaac won a whopping 150 million Indonesian rupiah (approx. US$15,600) as champion. Barrett, who topped the Round 2 finals earlier, settled for 100 million rupiah (approx. US$10,400) while Yannaphon took home 60 million rupiah (US$6,200). Hsieh earned 40 million, Surasak 25 million and Zulmazran 20 million for finishing fourth to sixth positions respectively. Remy Ong of Singapore missed the stepladder finals by a single pin while three-time Indonesia Open champion, Alex Liew of Malaysia was eighth a further 7 pins away. The top 16 women and top 16 men from Asia qualified the penultimate Indonesian leg of the ABF Tour 2012 which will be staged at Jaya Ancol Bowl tomorrow. 6th October, Jakarta: Thailand's Sarusak Manuwong and Malaysia's Shalin Zulkifli ended the Men's Open and Women's Open Round 1 Masters finals of the 10th Indonesia Internationa Open in pole position on Saturday evening. 2012 Thailand Open Masters champion, Surasak Manuwong got off the mark with a superb 255 to lead ex-international, Kang Bo Long in second. The Thai registered another splendid 227 to remain in the lead with Indonesia's Oscar moving up into second, 17 pins adrift. Surasak could not hold on to the lead despite a 205 in the third game as Hong Kong's Joshua Chow fired 213, 232 and 245 to take over the running. Chow continued with 214 in the fourth but a poor 157 in the fifth saw his lead reduced to just 4 pins from Surasak. Chow bounced back with 227 in the sixth game and continued to lead the field as Oscar moved up to second after rolling 219 and 225 while the Thai dropped off after several poor games. Surasak regained the lead after firing a sizzling 266 with Kang taking over second spot after two good games. The leader closed out the 10-game Round 1 finals with 245, 206 and 217 for a total of 2173. A second Indonesian and Asian Championships Masters bronze medalist, Hardy Rachmadian finishing strongly to clinch second spot with 2130. Kang settled for third spot with 2116 followed by Oscar in fourth position with 2115. 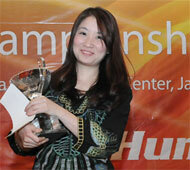 Defending champion, Yannaphon Larpapharat of Thailand stormed home to round out the top 5 with 2104. A third Thai, Annop Arromsaranon survived the cut despite a final game of 169 for a total of 1977, just 6 pins ahead of Singapore's Eugene Low, who missed the cut in 19th position with 1971. Meanwhile, Shalin Zulkifli of Malaysia, who has not won the Indonesia Open crown but triumphed in the 2009 Ancol International Open, snatched pole with 2169 pinfalls from pace-setter and 2005 Indonesia Open champion, Bernice Lim of Singapore. Lim set a blistering pace by rolling 224, 257, 194, 175, 212, 211, 224 and 209 before Shalin grabbed the lead two games before the round. The Singaporean settled for second with 2146, 23 pins adrift. A second Malaysian, Syaidatul Affifah, who kept close with the leading duo, finished third with 2055 while 2011 ABF Tour Indonesia champion, Hee Kar Yen and Indonesia's best women, Ivana Hie rounded out the top 5 with 2077 and 2023 respectively. Indonesia's Puteri Astari survived to make the cut in 14th position with 1869 while first game leader, Sariya Chongvarin rolled a big game of 245 to make the cut in 15th position with 1856. 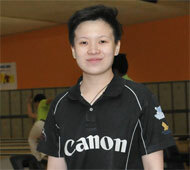 Newly-crowned Women's Grade A champion, Tan Bie Liang missed the cut by 13 pins to finish 16th position with 1851. The top 18 men will be joined by the top 3 local and top 3 overseas seeded qualifiers and the top 15 women will be joined by the top 3 local and top 3 overseas seeded qualifiers for another 10 games in Round 2 finals tomorrow morning. The top 6 men and top 6 women will advance into the stepladder shootout finals to determine the champions. 5th October, Jakarta: European Bowling Tour ranking leader, Dominic Barrett of England stormed into the lead of the Men's Open Masters qualifying table of the 10th Indonesia International Open to earn a bye into Round 2 Finals. Barrett, who was fifth in the overseas pool with 1400, improved his lowest 3-game series of 671 wth 793 for a new 6-game tally of 1522 thus becoming the first qualifier to break the 1500-mark. The 26-year-old from Essex, England, who had a disappointing outing at last week's PBA Tour-World Bowling Tour Thailand after finishing 17th position and failed to progress, will be hoping to put aside that poor performance by doing well in the finals on Sunday. Overnight leader and 2010 Indonesia Open champion, Hsieh Chin Liang of Chinese Taipei settled for second spot with 1461 while Hong Kong's Michael Tsang, who had dropped off the top 3 bracket, regained third spot with 1431. Perfect gamer, Isaac Russell Paul of Malaysia notched up two 700-series but missed the top 3 bracket by 7 pins to finish fourth with 1425. His compatriot, Zulmazran Zulkifli rounded out the top 5 with 1422 in fifth position. The cut at 12th position in the overseas pool went to Malaysian youngster, Johnathan Chan with 1345 while the cut at 11th position in the Mixed Pool went to Timmy Tan of Malaysia with 1302. National Interstate Championships five gold medalist, Ryan Lalisang headed the top 3 local qualifiers who have earned byes into Round 2 finals with 1450. 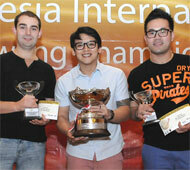 2012 Asian Schools Masters gold medalist Adhiguna Widiantoro and Oscar completed the top 3 with 1343 and 1326. There were no changes in the top 3 positions of the Women's Open Masters overseas pool with defending champion, New Hui Fen leading with 1386. 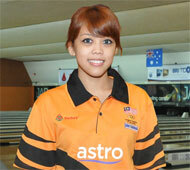 Reigning Malaysian Open champion, Zandra Aziela finished second with 1319. 2011 ABF Tour Indonesia champion, Hee Kar Yen and 2012 IBC first runnerup, Dayang Khairuniza tied in third with 1299 and may still have to have a one-game roll-off to break the tie to decide who would join Hui Fen and Zandra in Round 2 finals. Hong Kong's Milki Ng held the cut at 10th position in the overseas pool with 1250 while the cut at ninth position in the Mixed Pool went to Shinta Noen of Indonesia with 1116. Qualifiers for the Open Masters Round 1 will bowl 10 games tomorrow. The top 18 Men's Open and top 15 WOmen's Open finishers in ROund 1 will be joined by 6 seeded qualifiers for another 10 games in ROund 2 with all pinfalls dropped. The top 6 men and top 6 women will then advance to the Stepladder Shootout finals to determine the champion. 5th October, Jakarta: Nadia Pramanik and Billy M Islam triumphed in the Youth Girls and Youth Boys Under-20 Masters finals of the 10th Indonesia International Open to give Indonesia a first-ever double victory. National youths, Nadia Pramanik, 17 and Billy M Islam, 15 gave Indonesia their first-ever double victory in the Youth Under-20 Masters finals since 2003. The last time the nation came close to winning both the girls and boys titles was back in 2008 when Erick Ego won the boy's crown and Shalima Zalsa finished second. Malaysian youths, Najwa Ashikin and Nur Dayana set the opening pace after getting off the mark with 225 and 224 respectively. As Nur Dayana took over the running, Nadia Pramanik moved up into second spot after the second game. A second Indonesian youth, Shinta Noen shot into the front after the third game, Nadia kept closed with the leader through to the fourth game and narrowing the gap to just 2 pins. 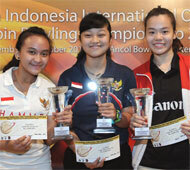 By the fifth game, Nadia stepped up her pace to lead the field and opening up a gap of 40 pins from Shinta. The 17-year-old, who won the Team bronze medal at this year's Asian Schools Championships, finished off with 1980 to secure the title. Alisha Nabila did well to finish second with 1919, 61 pins adrift while Singapore's Tay Hui Wen clinched third spot with 1885, 5 pins ahead of team-mate Ilma Nur Jannah in fourth with 1880. In the boy's division, 2012 Asian Schools Team gold medalist, Billy M Islam took the title with 2201, averaging an impressive 220. The 15-year-old, who was battling for the lead with Maaysia's Chong Jun Foo, finished 26 pins ahead of Chong. A second Malaysian, Ahmad Muaz Fishal took third spot with 2144 followed by Hong Kong's Leo Tse in fourth with 2121. Mohammed Haziq Sahli of Malaysia rounded out the top 5 with 2096. Early pace-setter, Muhd Naim Hashim of Malaysia fizzled off to end up in 13th position. Nadia won 6 million Indonesian rupiah (approx. US$600) as champion with Alisha and Tay taking home 4.5 and 3 million (approx. US450 and US$300) respectively as runnerups. Billy won 8 million (approx. US$800) for his effort while Chong and Ahmad earned 6 and 4 million respectively. The Youths Under-18 Masters finals for the boys and girls will be contested tomorrow morning (October 6). The Men's and Women's Open Round 1 Masters finals in the afternoon. The Men's Grade A Masters finals will be staged in the evening. 4th October, Jakarta: 2010 Indonesia Open champion, Hsieh Chin Liang of Chinese Taipei took over the lead of the Men's Open Masters qualifying table of the 10th Indonesia International Open on Thursday. Hsieh, who was third in the overseas pool with 1347, improved his lower 3-game series of 619 with 733 for a new 6-game tally of 1461 to take over the lead in the Men's Open Masters qualifying table. The Taiwanese also became the first qualifier to surpass the 1400-mark. Sarawak youth, Chong Jun Foo of Malaysia did extremely well in his first two attempts to register714 and 684 for a total of 1398 to take up second spot. Leader after the 12.00 noon squad, Michael Tsang of Hong Kong slipped down to third with 1388 to join Hsieh and Chong to earn a bye into Round 2 finals as the top 3 qualifiers in the overseas pool. Reigning Malaysian Open champion, Zulmazran Zulkifli finished fourth with 1366 missing the Round 2 cut by 22 pins followed by multiple Asian Games and World Championships gold medalist, Remy Ong of Singapore in fifth with 1364. Overnight leader and three-time Indonesia Open champion, Alex Liew of Malaysia dropped to sixth in the table with 1362. Isaac Russell Paul of Malaysia, who rolled the first perfect game of the tournament settled for seventh with 1360. Defending champion, Yannaphon Larpapharat of Thailand managed only 1352 for eighth position having a lower series of 661 which he can improved at tomorrow's final day of qualifying and earn a bye for Round 2 finals. Menawhile, defending Women's Open champion, New Hui Fen of Singapore secure a Round 2 finals after topping the overseas pool with a superb 1386 total. Reigning Malaysian Open champion, Zandra Aziela of Malaysia took second spot with 1319 while 2012 IBC first runnerup, Dayang Khairuniza of Malaysia made the Round 2 cut in third with 1299. 2011 ABF Tour Indonesia champion, Hee Kar Yen shared third spot with her compatriot with 1299 and may have to break the tie with a one-ball roll-off if she or Dayang does not improve their score. Overnight leader, Siti Safiyah Amirah of Malaysia slipped down to fifth with 1277 ahead of 2010 Indonesia Open champion, Zatil Iman of Malaysia in sixth spot with 1262. 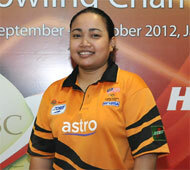 The current cut for Round 1 finals is held by Shinta Noen of Indonesia ninth in the Mixed pool with 1116. Qualifying ends tomorrow (October 5) and the Round 1 finals will be held on October 6. The Youth Under-20 Masters finals for the Boys and Girls divisions will be staged tomorrow morning while the Youth Under-18 Masters will be contested on Saturday morning, October 6. 3rd October, Jakarta: Three-time Indonesia Open champion, Alex Liew and Siti Safiyah Amirah of Malaysia grabbed the early lead in the Men's and Women's Open Masters qualifying table of the 10th Indonesia International Open underway at Jaya Ancol Bowl. Liew, who won the Men's title in 2005, 2006 and 2008, will be gunning his fourth record victory after taking the lead in the Men's Open Masters qualifying table with 718 and 635 for a 6-game aggregate of 1353. Defending champion and Asian Championships All Events gold medalist, Yannaphon Larpapharat of Thailand trailed in second spot with 1352 followed by 2010 Indonesia Open champion, Hsien Chin-Liang of Chinese Taipei third with 1347. The top 3 highest qualifiers in the overseas pool will earn automatic entry into Round 2 finals. 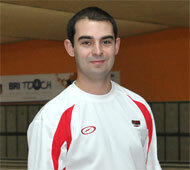 Singapore's Remy Ong finished fourth to head the next nine overseas qualifiers with 1329. SEA Games Team silver medalist and 2010 ABF Tour Hong Kong champion, Yeri Ramadona of Indonesia led the top 3 Men's Open local qualifiers with 1325. Fachri Askar and five gold medalists at this year's Interstate Championships, Ryan Lalisang for Round 2 finals with 1301 and 1299 respectively. Positions 10 - 12 plus 6 from Local seeded qualifiers and positions 4 - 12 plus 11 from Mixed Pool in the Men's Open division will bowl 10 games in Round 1 finals on October 6. The top 18 finishers will join the top 3 local and top 3 overseas qualifiers for another 10 games in Round 2 finals on October 7 pinfalls dropped. The top 6 finishers at the end of the Round 2 finals will advance to the stepladder grand finals. Meanwhile, Siti Safiyah Amirah of Malaysia topped the Women's Open top overseas qualifying table with 1277 ahead of team-mates and two-time Malaysian Open champion, Zandra Aziela in second with 1260 and 2012 IBC first runner-up, Dayang Khairuniza in third with 1257. 2009 ABF Tour Macau champion and 2010 Asian Games Team silver medalist, Putty Armein headed the top 3 local qualifiers for Round 2 finals with 1284. 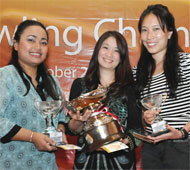 Her compatriots, Sharon Limansantoso and Novie Phang finished second and third with 1279 and 1213. Positions 9 - 10 plus 5 from Local seeded qualifiers and positions 4 - 10 plus 9 from Mixed Pool in the Women's Open division will bowl 10 games in Round 1 finals on October 6. The top 15 finishers will join the top 3 local and top 3 overseas qualifiers for another 10 games in Round 2 finals on October 7 pinfalls dropped. The top 6 finishers at the end of the Round 2 finals will advance to the stepladder grand finals. Qualifying will run through to October 5. The Men's and Women's Graded A Masters finals will be held October 4 while the Youth Boys Under-20 and Youth Girls Under 20 Masters finas will be held on October 5.